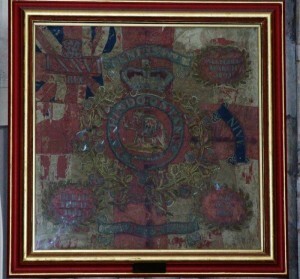 In 1787 four regiments were raised for service in India, one of them was the 76th. The Regiment arrived in India in 1788. Most line regiments have fought in India at some time but none won such distinction in so short a space of time as the 76th. India at the end of the 18th century was in a state of chaos, largely due to the disintegration of the Mughal Empire. Shortly after the Regiment arrived in India war broke out with Tipu Sultan, the Moslem ruler of Mysore and they took part in the campaign to defeat him, including the capture of his capital, Seringapatam, for which they were later to be awarded the battle honour “Mysore”. They then moved to Northern India. War broke out in 1803 with the Mahratta princes, a powerful Hindu confederacy of five princes. They controlled most of central India and aspired to substitute their rule for that of the Moghuls, keeping the Moghul Emperor a virtual prisoner in his palace in Delhi. Their armies were trained, and sometimes commanded by, the French. An army under General Lord Lake, including the 76th which was the only British infantry Regiment serving alongside seven native infantry regiments in the army, was tasked with annexing the Mahratta’s northern territories and delivering the Mughal Emperor from their clutches. Lord Lake’s first major action was at Ally Ghur, a strong fortress protected by an immense wet ditch which could only be passed via a single gateway and was regarded as impregnable. The 76th were chosen to lead the assault at first light. With the aid of a 12 pounder cannon they were able to force both the outer and inner gates, gain entry to the fort and secure its capture. Lord Lake now continued his advance on Delhi. Depleted by his Ally Guhr casualties and men left behind to garrison the fortress, Lord Lake could deploy no more than 4,500 against some 19,000 Mahratta. Lord Lake could not risk a direct attack but set about luring the enemy into a trap by sending forward first his cavalry and then having them retreat to lure the enemy out of their defensive positions onto the infantry formed in line behind a ridge, who then counter-attacked with devastating effect, routing the enemy. The commander of Delhi surrendered two days later and the Mughal Emperor was granted British protection. Nevertheless the Maharattas were still full of fight and Lord Lake’s army, with the 76th, then went on the fortress at Agra, which capitulated after a week’s siege, with no casualties for the 76th, and then, finally, in 1803 the victory at Leswaree, one of the fiercest battles fought in India, the infantry going into action having marched 65 miles in 48 hours. In a little over two months Lord Lake and his army which, because of the need to detach troops for line of communication duties at no time exceeded 8,000 men, had destroyed thirty one of the Mahratta’s European trained battalions, captured the fortress of Ally Ghur, entered the imperial city of Delhi, captured 426 cannon and defeated the enemy in four pitched battles. By securing the ancient Mughal capital of Delhi, and all the territory north as far as the Punjab, for the East India company it laid the foundations upon which the Raj would be built. 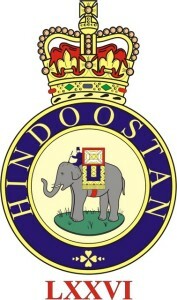 For the part the Regiment played in the capture of Ally Guhr and Delhi, the Regiment was awarded, by the East India Company, an honorary stand of Colours and, at the behest of the Company, the Regiment was authorized to wear the word “Hindoostan” on its Colours and appointments and at Lord Lake’s request permission was granted to use the badge of an ‘elephant’.